‪radioBollyFM presents most authentic TOP 10 CHARTBUSTER on every week. Check out previous show listing http://blog.radiobollyfm.in/top10. Don't forget to tune into www.radiobollyfm.in for the "BOLLYFM TOP 10" radio show hosted by RJ Swapnil with new Bollywood celebs on every week. 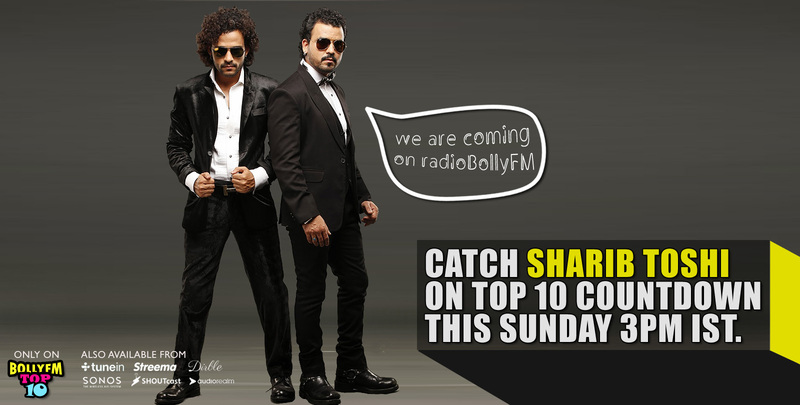 Don't miss the episode this week, Catch Sharib Toshi exclusively on www.radiobollyfm.in with our RJ Swapnil. Sharib-Toshi are one of the most dynamic Music Directors/Singers/performers. They have scored for more than dozen big Banners films(Vishesh Films /Madhur Bhandarkar Production/Vijeta films/Vikram Bhatt production/ Dharma Production). They are the best performers of India and all set to rule the Bollywood! "Pyar Ki Maa Ki" from Housefull 3 sung by Anmol Malik, Divya Kumar, Nakash Aziz, Sharib Sabri. This song is composed by Sharib Toshi with lyrics penned by Danis Sabri, Farhad-Sajid, Manoj Yadav.